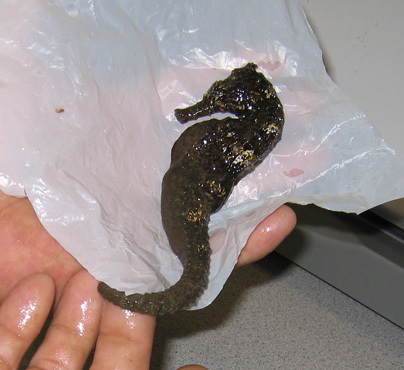 Malia Wallace noticed something strange in the water near her dock in Hawai'i-kai, so she scooped it up with a net and lo and behold, it was a large seahorse! She weighed the unique ocean creature at Hawaii Fishing News' office then took it back to the marina and released it. Dr. Jack Randall later identified the unique creature as a smooth seahorse (Hippocampus kuda). Cool!